For a Whovian on holiday, looking to take their fandom to the next immersive level, the United Kingdom is obviously going to be your destination of choice. Doctor Who-themed tourism is available to travelers on many fronts once their feet hit British soil, and if you arrive in the U.K. at the right time, you can hop on the plane back home with your head spinning from fun Gallifreyan times. I’ve made the trip from Toronto twice within the past year and a half and sampled a fair bit of the British timey-wimey experience; this report is an amalgam of both trips. The primary place you’re going to want to hit while journeying to Great Britain is the Welsh capital city of Cardiff. The BBC films a lot of their drama in Cardiff, even series set in London or elsewhere. The recently-built BBC Cymru Wales production facility is called Roath Lock, and can be seen at Porth Teigr at Cardiff Bay. In addition to Doctor Who, such shows as Sherlock, Casualty and Luther are filmed on site. The stages also housed Upstairs, Downstairs until its cancellation, and The Sarah Jane Adventures was due to be moved there as well, until Lis Sladen’s untimely passing in 2011 ended that show. For North American Anglophiles, those of us whose PVRs are locked on BBC Canada or BBC America, the sight of this massive, elegant facility might just cause a few goosebumps, even if a tour of Benedict Cumberbatch’s dressing room is off the table. Just down the pier, however, is the newly-opened Doctor Who Experience, which is an absolutely unmissable destination for any self-respecting Whovian. Until recently, the Experience was housed a few hundred meters towards the city in the Red Dragon Centre. It was pretty fun for a quick visit, but in the opinion of this tourist, was a bit of a letdown. One could walk through the entire exhibit in fifteen minutes or so, and despite the thrill of being able to pose for a pic standing next to the TARDIS and see a screeching Dalek rise ominously out of the displays, the exhibit was limited to wardrobe and props from 2005 onwards. Which is all well and good, but fans of the classic series might feel like they’ve been given short thrift. Plus, dry ice was constantly being pumped into the facility, fogging up your photos and making your clothes stink of CO2. The Red Dragon Centre exhibit has been neatly left in the dust by the airplane hanger-sized Porth Teigr facility, which opened in July 2012, and all complaints about limited scope are put to rest upon the sight of Bessie, the Third Doctor’s jalopy, right in the front lobby (this is likely the first time you’ll notice, interestingly, that all signage in the museum, including on all the displays, is bilingual in both English and Welsh). The new Experience has two components. 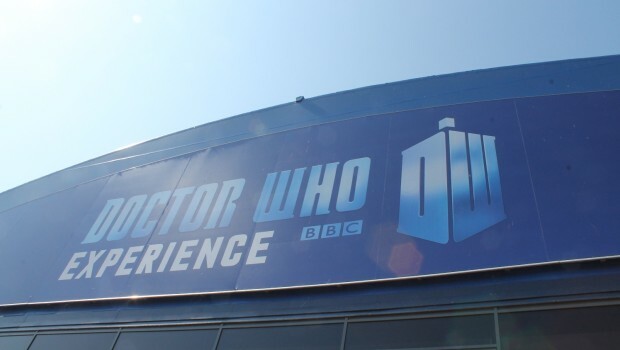 First up is the interactive adventure: after a film montage of Moffat-era adventures, a familiarly-shaped crack in the screen opens up and you step into a series of rooms full of classic props, as well as large monitors running a film starring Matt Smith specifically filmed for the attraction. The Doctor’s got himself stuck in yet another Pandorica, and only you and the rest of your tour group can land the TARDIS, evade the Daleks, creep past the Weeping Angels and save him…yeah, it’s kinda cheesy if you’re over twelve years old, but still a lot of fun. Think of it…you get to fly the TARDIS! Once the Doctor is freed, you’re let into the exhibition part of the Experience, a colossal warehouse filled with props and costumes from (yes, at last) all eras of the show. And when I say “all eras,” I mean “from William Hartnell’s suit up to SPFX models from literally the last episode to air.” At this point you can also begin taking as many photos as you want; personally I took enough with two cameras over two visits to render the place on Google maps. One diorama features the genuine (well, sometimes refurbished) costumes from the first eleven Doctors, a godsend of reference for cosplayers striving for accuracy. 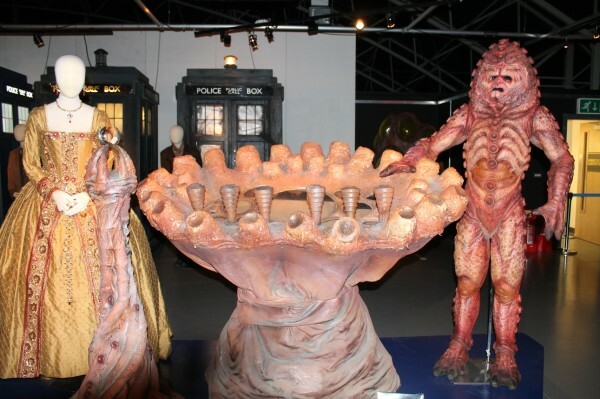 Two of the classic TARDIS control panels (the original, as well as the revamp introduced in “The Five Doctors”) have been mounted on the exhibition floor, as has the organic coral style control room introduced in 2005, which actually still bears scorch marks and damage from the Tenth Doctor’s flame-heavy regeneration. Just about every classic monster is represented by the original costume or prop: the Ice Warrior stands next to the reboot’s Silurian. One can see the evolution of the Sontaran makeup, and each stage of Cyberman helmet development is on display. A recent addition since the 50th Anniversary of the show is a section of props and wardrobe from “The Day of the Doctor” including trio of TARDISES (TARDII? Discuss. 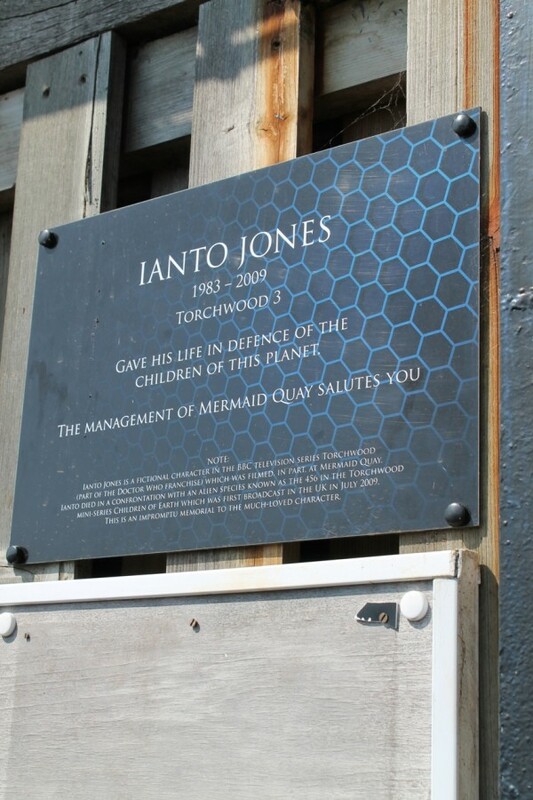 ), belonging to Tennant’s Tenth, Smith’s Eleventh and John Hurt’s War Doctor, and the UNIT archive bulletin boards, which display an unexpectedly moving photo montage of the show’s history. 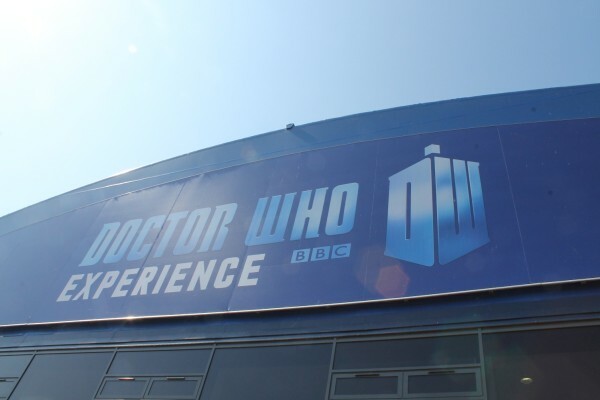 You can buy a ticket for just the Experience, but there’s also a package available which gets you a t-shirt, the official program, a stack of postcards and a certificate stating that you’ve flown the TARDIS. After checking the prices in the gift shop (in which, if you’re anything like me, you’ll be tempted to take out a second mortgage to load up on souvenirs) the package does let you come out more than a few quid ahead. One last word of advice: skip the coat check and wear your jacket into the Experience. It’s really, really chilly on the museum floor, at least in the winter. On the other hand, if you’d like a more organized, comprehensive tour and don’t want to be driving around looking for hidden addresses while trying to stay on the correct side of the road, the Doctor Who Locations Tour is your best bet. 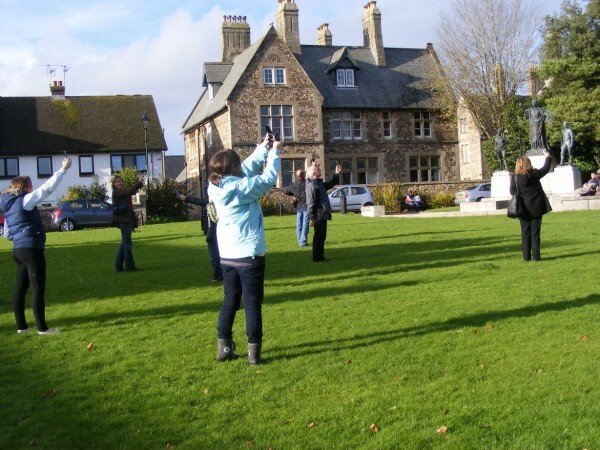 Run by Brit Movie Tours, which also organizes themed tours in London (Sherlock Holmes, James Bond, Harry Potter) and Ireland (Game of Thrones), the DWLT runs from April to early November, with some special holiday excursions outside those dates. I lucked out with my schedule on one trip and was able to get onto the last regular tour of 2012. Our guide was local writer and actor Matthew Jay, who’s been fortunate enough to be a background performer on Doctor Who on several occasions. He was a soldier electrocuted by the Slitheen in “World War 3,” a cabinet minister gassed by the Master in “The Sound of Drums” and stood behind David Tennant in the bookstore line towards the end of “The End of Time,” among other appearances. Matthew has loads of behind-the-scenes stories, many told in a self-deprecating way about his own fannish behavior on set. Next: From Cardiff to London to check out Who vets in the West End, and thence to Newcastle (well, Seaton Burn, anyway) for a Doctor Who event that upends my expectations and understandings of fan conventions and prompts me to make several huge and probably inaccurate blanket statements about British fandom and geography.